Terra - alongside Aqua and Ven - is one of the protagonists of Birth by Sleep, and appears to be the oldest of three. He trains with Aqua and Ven to become a Keyblade Master, and shares a brother-like bond with the latter. In spite of the darkness in his heart, he tends to maintain a calm and cool persona and isn't afraid to risk injury in battle for his friends. Four years before the main events of Birth by Sleep, Master Xehanort visits the land of Departure with his then-apprentice Ven, Xehanort requesting that Master Xehanort take Ven under his wing as apprentice. Terra greets Ven and inquires as to who he is and where he came from, at which Ven cries out in pain before falling into a comatose state for several days, all the while Terra blaming himself for Ven's state. To make it up to Ven, Terra befriends him and the two spend the day sparring, Aqua joins them, and Terra tells Ven about his dream - one shared with Aqua - to become a Keyblade Master. Over the coming years, the three spend time together wherever possible, honing their skills and strengthening their friendship. The night before Terra and Aqua's Mark of Mastery Exam - where Birth by Sleep begins in earnest - the three young Keyblade wielders are thinking of their future. Aqua, understanding they will likely be tasked with undertaking their own separate adventures after the conclusion of the exam, gives to Terra and Ven good luck charms, shaped after a mythical fruit that kept people linked no matter where they were. On the day of the exam, Master Xehanort arrives to oversee the trials, which Aqua passes but Terra fails, his inadequacy attributed by Master Eraqus to his inability to control his own darkness. Unknown but later discovered is the fact that Master Xehanort was the cause for that darkness' presence, introducing it to tailor the exam's results to his own ends. Later in the day, Xehanort approaches Terra and tells him that the darkness in his heart needn't be a problem nor something feared and that - contradictory to what Master Eraqus might seek - darkness is not something that can be destroyed, only directed in various ways. Very soon after Xehanort and Terra part ways, Terra is sent on a quest to seek out Xehanort - who has supposedly vanished unannounced and without a trace - as well as investigate and stop the threat posed by the emerging Unversed. Eraqus coaxes cooperation out of Terra by telling him that if he succeeds, Eraqus will reconsider the results of the Mark of Mastery exam and make Terra a Keyblade Master. During his quest, the darkness residing in Terra's heart catches the attention of a number of villains across the worlds, who manipulate Terra through his darkness and take advantage of his trusting nature to commit evil acts. One such dark denizen is the witch Maleficent, who has Terra steal the heart of the Princess Aurora - this act and many more like it forming a lingering guilt in Terra's mind that stays with him through the entirety of his journey. Trailing behind what leads he can find of Master Xehanort, Terra is led to Radiant Garden where he initially spots Xehanort, but is distracted by a massive Unversed, the fighting of which eventually reunites him with Aqua and Ven, where their meeting is less than happy. Though well-meaning, Terra commands Ven to return home to safety, soon after discovering that Aqua was sent by Master Eraqus to spy on him. Terra leaves the two of them both angered and hurt, and soon runs into Master Xehanort once more. It appears he's been captured by a gun-toting Braig - one of Ansem the Wise's apprentices - who fights Terra, thinking he will gain his Keyblade if victorious. Unable to overcome Braig's dirty tactics in the ensuing battle, Master Xehanort calls out to Terra to tap into his darkness, which temporarily augments his abilities to the point where he is able to defeat Braig. After the battle, Xehanort insists to Terra that he controlled his darkness, rather than the opposite, though the young Keyblader is still sceptical. Master Xehanort offers Terra a position as his apprentice and explains further to Terra the nature of darkness - that it is always born within light - causing Terra to doubt Eraqus. Xehanort then states it is his mission to rid the worlds of the darkness that upsets its natural balance with light - the source of which is Vanitas - and begs Terra to aid him, pulling the final string when he acknowledges Terra's long-held wish and addressing him as ‘Master Terra'. These cumulative efforts of Xehanort's have Terra acknowledge the Keyblade Master as his direct superior. As Terra prepares to leave Radiant Garden, Ven approaches Terra, seeking to tag along with him on his journey, which Terra refuses, though he does comment that should Terra ever really need him, he knows Ven will be there. Later on, Terra is guided by a warm light to Destiny Islands, where he discovers the destiny-linking Paopu Fruit that was the inspiration for the charms given by Aqua. On this world he finds two young boys that remind Terra of himself and Ven. Terra, speaking with the slightly older one that reminds him of himself, discovers the potential within the boy, and performs a Keyblade Inheritance Ceremony, allowing a young Riku to wield the Keyblade when he is older. Terra is soon called to the Keyblade Graveyard where Master Xehanort awaits, who informs Terra that Ven has learnt of his past and is returning to Eraqus to confirm what he has learnt so far. When Xehanort tells Terra that Ven will likely be taken out by Eraqus, Terra is quick to depart the world and rush to Ven's aid in the Land of Departure, where he arrives just in time to block a would-be fatal blow of Eraqus and eject Ven from the world through a Corridor of Darkness. Refusing to stand down, Terra battles and soundly overcomes Eraqus, who insists he failed both Terra and Ven for raising his weapon against them, and must himself be corrupted with darkness to have done so. Terra refuses to strike down Eraqus, and it's at this moment that Xehanort arrives and lands the killing blow on his old friend. Before he leaves, Master Xehanort shrouds the world in darkness and beckons for Terra to return to the Keyblade Graveyard. Upon arrival, Terra reunites with Aqua and Ventus, explaining to them what happened and confiding in Aqua that his actions did warrant her spying on him. Though some animosity still persists between the three, they are able to put it behind themselves as their final confrontation with Master Xehanort and Vanitas begins. After Ven is frozen and dropped off a cliff, Terra' anger fuels his darkness until he is unable to control it, at which point Xehanort marvels at the creation of the χ-blade before unlocking his heart and possessing Terra's body, seeking to use it as a younger and more powerful body in place of his old and frail one. In the ensuing internal struggle, Terra's mind is ejected from his body entirely, but it finds refuge in his suit of armour, which it animates and fights back against the newly-formed Terra-Xehanort with, eventually able to knock him out. Through the explosion resulting from the χ-blade's destruction, Terra-Xehanort is transported to Radiant Garden. After leaving Ven in the newly-formed Castle Oblivion, Aqua is guided by Terra's voice to Terra-Xehanort, though she is unable to draw Terra's persona out of the hybrid being. Terra-Xehanort attacks Aqua, confused and still fighting an internal struggle, and in the ensuing battle Terra is able to gain the upper hand in the battle within himself. Xehanort exerts a last desperate attempt at control, using his Keyblade to once more unlock his heart in an effort to remove Terra. This, however, results in Terra-Xehanort losing all his memories and being substantially weakened, to the point where he begins to sink into the Realm of Darkness. Aqua dives in after him, and it is only by her sacrifice that he is able to return to the world. Soon after, Braig guides fellow apprentice Dilan and Ansem the Wise to the spot where Terra-Xehanort lies alongside Aqua's discarded armour and Keyblade. Ansem asks the amnesic man what his name is, to which he replies the one thing he recalls: "Xehanort". However, even as Xehanort continues to live on in Terra's body as he remains trapped in a seemingly eternal struggle with Master Xehanort, it appears that he has aims of his own. With no hesitation whatsoever, Terra is willing to sacrifice everything he is, everything he has, in order to achieve them and help his friends; to put his very being at risk, even if it means he has no choice but to travel down the wrong path. Wherever he is now, Terra waits for the one who will be able to reunite him with all those he cares about. 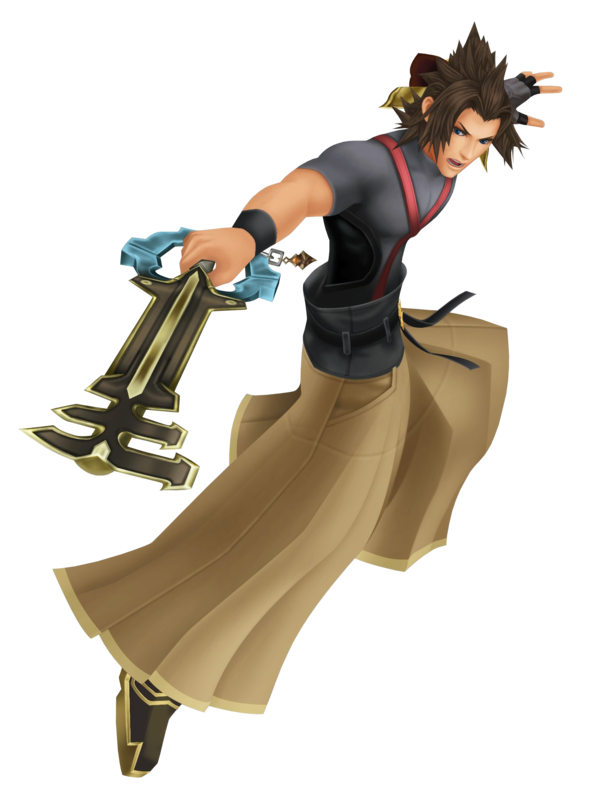 Strong and sturdy like his name with a heart of gold, Terra is one of three Keyblade wielders who've since fallen by Xehanort's hands. He lost not only his friends, but his freedom a decade before Sora's adventure when Xehanort forced him to become his new vessel. His current status and location is currently unknown. Terra appeared to Sora for a split moment as he dove deeper and deeper into the dreams could no longer differentiate them from reality. He said just a single word; a name ─ Ven. Friend to Ventus and Aqua, as well as one of Master Eraqus' pupils. He was blinded by Master Xehanort's plans and is now lost in darkness. His physical body has been taken over by Xehanort. During Aqua's travels in The Dark World, Terra appeared as a guide for the lost soul, reminding her to keep strong. He was somehow able to appear in Enchanted Dominion where he conversed with Aqua, however this was a ploy by Xehanort to try and find out where Ventus is kept. He was last seen encasing Terranort in golden chains as Aqua passed out.